Researchers at Western University recently hosted one hundred participants, including primary health care practitioners, policy-makers, researchers, and electronic medical record vendors from across Canada, at the Bridging the Gaps: A Canadian Primary Health Care Electronic Medical Record Conference held in Toronto, Ontario on March 1st, 2012. The conference goal was to bring stakeholders from diverse groups together to advance the resolution of key research and policy issues regarding the implementation and use of primary health care electronic medical records in Canada. These issues are important because Canada's level of primary health care electronic medical record use is significantly lower than other countries such as the United Kingdom, the Netherlands and Australia. 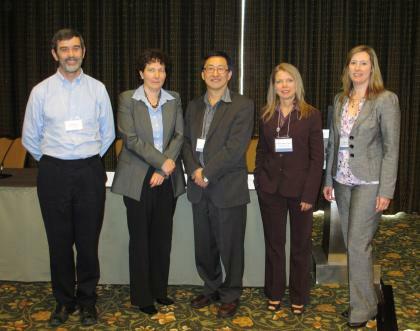 This conference was held in partnership with the Canadian Institute for Health Information (CIHI), and is part of a Canadian Institutes of Health Research (CIHR)-funded knowledge translation study called "Creating the Agenda for Tomorrow's Electronic Medical Records in Primary Health Care" (CREATE-PHC). The CREATE-PHC study is led by researchers from the Centre for Studies in Family Medicine, Department of Family Medicine and the Department of Epidemiology & Biostatistics, Schulich School of Medicine & Dentistry, and builds on a CIHR-funded study led by the same researchers called "Gaps in Knowledge and Research". The specific objectives of the conference were to: impart new research and policy-relevant knowledge regarding primary health care electronic medical records; encourage discussion regarding current issues in primary health care electronic medical record use in Canada; create an action plan to advance primary health care electronic medical record research; and, develop electronic medical record-relevant policy recommendations. Two well-received keynote presentations were given by Dr. Frank Sullivan, Director of the Health Informatics Centre at the University of Dundee, Scotland, and Ms. Lynne Zucker, Vice President of Clinical Systems Integration at Canada Health Infoway. Following the keynote presentations, Dr. Amanda Terry, Assistant Professor at Western University shared learnings from the "Gaps in Knowledge and Research" study. Finally, Ms. Patricia Sullivan-Taylor, Primary Health Care Program Manager at the Canadian Institute for Health Information (CIHI), made a presentation which focused on CIHI's electronic medical record- based Voluntary Reporting System. In the second half of the day, attendees participated in small dynamic group discussions focused on creating research ideas or policy recommendations that would begin to address the identified gaps in the primary health care electronic medical record domain. Each group developed three key ideas focused on a specific gap, and sixty group members indicated their interested in continuing their discussions in follow-up teleconferences hosted by the CREATE-PHC team. The CREATE-PHC team intends to continue its work toward addressing the key research and policy issues regarding primary health care electronic medical records in Canada through these follow-up teleconferences, as well as other activities. Link to "Primary Health Care Electronic Medical Records: Gaps in Knowledge and Research in Canada" Study.